Factory-raced Speed 6s contributed more to the Bentley story than any other model. These specially-prepared models won the 24 Hours of Le Mans as well as the famed Brooklands Double 12. Three of the factory ‘works’ cars, known as Old Number 1, 2 and 3, garnered most of the acclaim and are currently considered the most desirable of all Bentley models. Bentley founder Walter Owen Bentley considered the Speed Six his favorite model. It was successful and the largest racing model offered by Bentley. Also, it capped off the legendary series of Le Mans victories including 1924, 27, 28, 29 and 30. The later of these was achieved with Speed Sixes fitted with the Van den Plas bodywork from Belgium. Basis for the Speed 6 and all of Bentley’s prewar cars was an engine which in many respects was ahead of its time. Drawing upon experience gained from working at the Great Northern Railway and designing airplane engines, Walter Owen Bentley included such characteristics as aluminum pistons, dry-sump lubrication, twin spark ignition and an advanced valve train in his engines. By 1928, Bentley was also selling cars to be raced by private entrants including the 4.5 liter Bentleys which raced alongside the Speed 6s. Of the nearly 200 Speed Sixes made, some received the most extravagant English coachwork, while others were sold as private competition cars. For the 1928 season, Bentley decided to prepare a works version of the Speed 6 to enter the major races that year and it became Bentley’s definitive race car. Since Speed Sixes were in regular series production, and Van den Plas made many Le Mans-type bodies for customers, distinguishing the works cars from the customer cars is a hard task, especially given that some of the changes remained confidential. However we can say the Works car received lighter bodies, 25 gallon gas tanks, Bentley & Draper double front hydraulic shock absorbers, hotter camshafts, heavy front axle beams with integral jacking pads, special headlamp support bracket castings with bearings for the Perrot shafts, and sometimes a central Marchal headlight for night runs. However, the most important characteristic of the Speed 6 was its ability to run flawlessly all day and night. At Brooklands the Works cars were fitted with mufflers and fishtail exhausts, but elsewhere it raced with straight pipes. The first car known currently known as ‘Old Number One’ and licensed LB2332 debuted as a factory race car on May 1929 for the first ever Brooklands Double Twelve race on May 10th. Unfortunately, the engine’s dynamo drive coupling failed, but this was not any indication of things to come from the Speed Six. A month later ‘Old Number One’ was fitted with a straight-pipe exhuast and entered as race number one for the 24 Hours of Le Mans with drivers Woolf Barnato and Henry Birkin. It was recounted “The Speed Six, driven by Birkin, was first away on the flagfall and apart from the problems with shifting ballast on the Clement Chausan 4½ litre and the retirement of the Earl of Howe in No. 11 with magneto trouble, the four Bentleys held the first four places virtually from beginning to end.” And so the 4½-Litre entries gave Bentley a historic 1-2-3-4 victory. This encouraged the factory to keep ‘Old Number One’ and raced it at many more British events, winning the Brookland’s Six Hour Race. Again the Junior Car Club held its Double Twelve race at Brooklands and the two new cars faced 57 other competitors. These were both trimmed like the Le Mans car, with oversize front headlights and hydraulic shock absorbers. Barnato and Clement finished first overall in HM2868, having covered 2080 miles at an average speed of 86.68 mph. For the 1930 Le Mans, W.O. Bentley raced all three Speed 6s for the first time. They were joined by a gaggle of 4½ Litre Blowers that were developed by Tim Birkin. 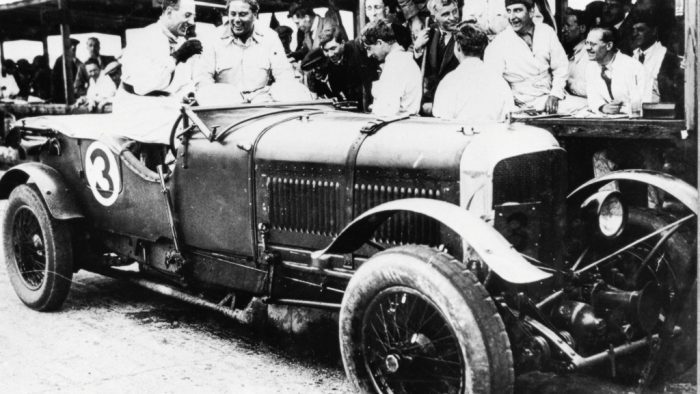 The real threat came from a lone supercharged 7-litre Mercedes Benz threat which Woolf Barnato had to chase down. It was recounted “Barnato finally took the lead on the 36th lap, pushing the Mercedes into using the clutch engaged supercharger all the time, the whine of which could be heard all the way round the track. It was well known that too much use of the supercharger would blow the Mercedes engine and Barnato was playing his part to perfection.” They swapped places several times but on 59th lap the Mercedes challenge was over with no official reason given. The rest of the race was cakewalk as Bentley had a large lead at this point. Frank Clement and Richard Watney in HM2869 took the overall victory after 2,832 kilometers at an average speed of of 73.08 mph. Old Number One with the race number 4 came in second place. This was fourth consecutive Le Mans victory for Bentley which proved the continued reliability and performance of the Speed 6. 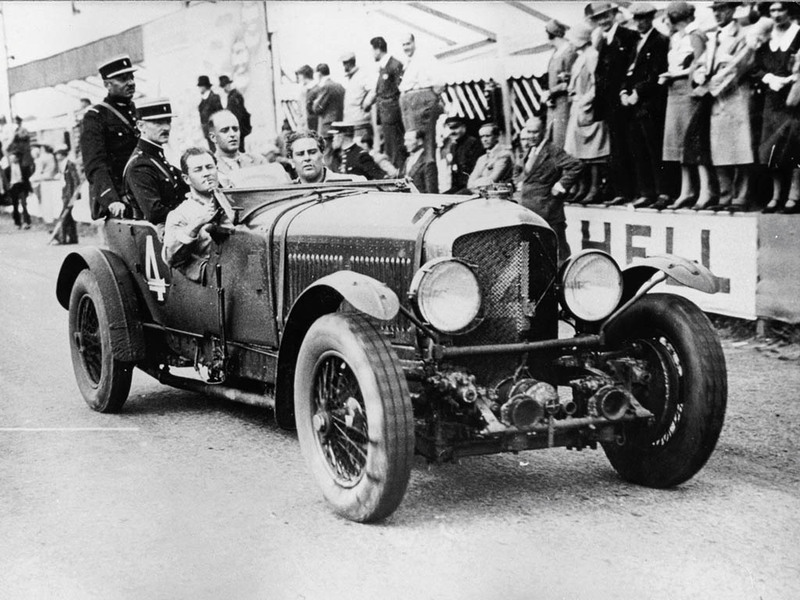 After 1930, Bentley retired from racing, ending a chapter in British motor racing history. Chassis LB2332 licensed MT3464-This was the first Speed 6 to enter a race, that being the 1929 Brooklands 24-Hours which resulted in DNF due to a dynamo coupling. A month later the mufflers were removed and it won the 24 Hours of Le Mans. Later in the year it appeared at the Brooklands 6-Hour, Irish Grand Prix at Phoenix Park and suffered minor damage at the Isle of Man TT Race. By October 12th October 1929 it was fitted with fishtail rear bodywork for the 500 mile Brooklands race. After this, the car was thoroughly overhauled and wasn’t seen again until June of 1930 for the 24 Hours of Le mans, where it place second. 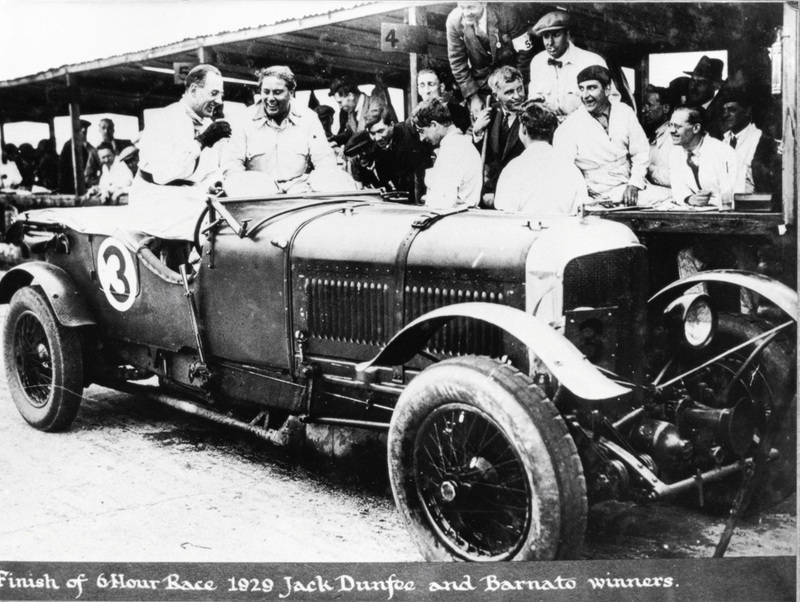 After the race it was sold to wealthy racer and financier Captain Barnato for private use. He changed the front windscreen and added a muffler. After being pressed by Jack Dunfee, he decided to fit the fishtail body on and continue racing. After placing third at the 1932 Brooklands 500, a crack was found in the chassis so the car was again comprehensively rebuilt by Walter Hassan including the fitting of stronger and shorter four-liter chassis rails. Furthermore, an 8-liter Rolls-Royce engine was installed. In this configuration the car raced the 500 miles race at Brooklands but driver Clive Dunfee went over the top of the banking and lost his life. The car survived, but was permanently retired from racing. Chasssis HM2868 licensed GF8507-Built in 1930 on a 11-foot chassis, HM2868 won the 1930 Brooklands 24 hour race with Barnato and Clement driving. The same car was used at Le Mans and placed second. After the war, it was owned by Carl Meuller who kept the car largely as-is from 1950-1975. No long after the sale, the owner took the car to Graham Moss of R.C. Moss for a light restoration. Many of the details were corrected and a curious hue of British Racing Green was found to be the original color. It was painted and numbered in time for the 2007 Goodwood Festival of Speed and subsequently shown at the 2007 Pebble Beach Concours. 1.’The Case of Old Bentley Number One’. HUBBARD vs. MIDDLEBRIDGE SCIMITAR LIMITED. gomog.com. 2.Birkin, Sir Henry. Full Throttle. G.T. Foulis & Co., Ltd., London: 1932.